Marimekko, the textile, apparel, and interior design company, was founded in Helsinki, Finland, in 1951 by the husband-wife team, Armi and Viljo Ratia, as an outgrowth of Printex, their oilcloth manufacturing company purchased in 1949. As the artistic director, it was Armi's decision to use the colorful, nonfigurative patterns designed by Finnish artist Maija Isola, which were silk-screened by hand on cotton material. It was difficult to get consumers to understand these new types of designs, as they were completely different from the traditional floral fabrics. Armi came up with the idea of using the fabrics in a collection of dresses, whose bright colors and simple style were warmly embraced in post-World War II Finland. The name Marimekko, which translated means "little dress for Mary," comes from two words: mekko meaning a peasant woman's simple dress and Mari, the Finnish form of Mary or Maria, which is the eternal name for the eternal woman. The essence of Marimekko from the beginning was a certain way of dressing-a simple, comfortable, cotton dress that exemplified the Finnish ease of lifestyle. One of the psychological factors behind the popularity of Marimekko design is its elemental diversity. Marimekko has offered the possibility of totally contrasting associations and identifications. It has fused traditionalism and radicalism, decorativeness and asceticism, anonymity and difference, the ordinary with the festive, and pure Finnish rural with international city style. At its peak, the design managed to appeal equally to young radicals and old intelligentsia, to a new breed of career woman as well as old-school housewives. Marimekko soon found a large, enthusiastic audience in the United States. Architect Benjamin Thompson, founder of Design Research (D/R) in Cambridge, Massachusetts, saw Printex fabric and Marimekko dresses at the Brussels World's Fair of 1958. When D/R prepared for an American exhibit of Finnish design in 1959, Armi Ratia arrived with two cardboard boxes of dresses and fabrics, that were an immediate hit. Ben Thompson's reaction to this was: "Marimekko certainly belonged at Design Research. Nothing like it had been seen in America. It matched the mood of the times" (Suhonen, p. 110). When Jacqueline Kennedy purchased seven Marimekko dresses to wear during the 1960 Presidential campaign, it was reported in 300 U.S. newspapers, making Marimekko a household name. In the 1960s, Marimekko was celebrated worldwide for its apparel and textiles that reflected the events and current trends of the decade: Op and Pop Art, flower power, student revolts, and the conquest of space. With Armi Ratia's death in 1979, the future of Marimekko seemed uncertain. In 1985 Marimekko was sold to Amer Group Ltd., and later was acquired by Kirsti Paakkanen in 1991. By 2004 Marimekko had become a public company with some 800 retailers around the world, and was experiencing a revival with a new generation of consumers. Armi Ratia (1912-1979) was the driving force behind the early success of Marimekko. The combination of her education as a textile artist and her work experience in public relations was a definite advantage to the company. At first Armi served as the Artistic Director, but eventually she became Marimekko's Managing Director. An idealist and a visionary, Armi was unafraid of taking risks. These assets combined with intelligence and a forceful personality made Armi capable of making Marimekko a successful business, but also of shaping it to become a cultural phenomenon. She served as an unofficial ambassador for Finland through worldwide representation of the company and by entertaining clients and guests lavishly at her summer manor house, Bökars. 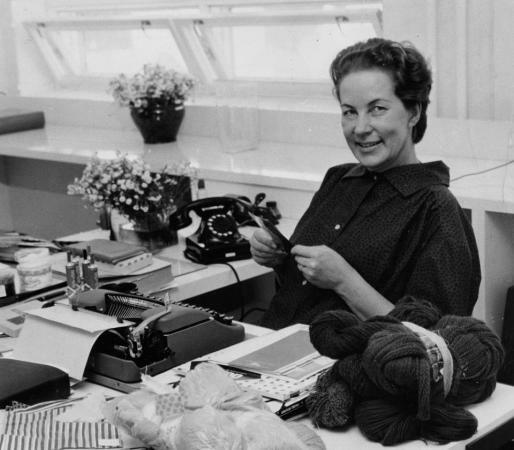 Maija Isola (1927-2001) started working for Printex in 1949 and for Marimekko in 1951, where she continued to design fabrics until 1987. One of her most popular designs is Unikko, the large and colorful flower originally designed in 1965. In more recent years, it saw a huge revival and its popularity has made it an inadvertent trademark for Marimekko. Maija's daughter, Kristina Isola, joined Marimekko in 1964 and worked with her mother until 1987. She has updated some of her mother's original designs with new adaptations and colors, as well as creating new designs of her own. In 2000, Pieni Unikko was created using the original flower in a smaller scale in new colorways. Vuokko Eskolin Nurmesniemi (b. 1930) became Marimekko's chief clothing designer in 1953 and worked for the company until 1960. Vuokko's design concept for Marimekko remained into the twenty-first century: easy-to-wear clothing that has a minimum of buttons, darts, and detailing. In 1953 she designed Piccolo, a striped fabric that was produced in 450 colorways. A few years later, it was used in the creation of Jokapoika, or "Everyboy," a plain Finnish farmer's shirt, commonly known in the United States as the Finn Farmer shirt. In 2004, the Jokapoika shirts were still in production. Annika Rimala (b. 1936), the main clothing designer at Marimekko from 1959 to 1982, wished to produce clothing that was timeless, that represented ease in lifestyle, that was available from one year to the next, and that was suitable for men, women, and children alike. Inspiration for her famous Tasaraita, "even-stripe," cotton jersey T-shirts came in the 1960s when Levi Strauss blue jeans, formerly work clothes, became that of casual, everyday wear. Hence, the colorful even-stripe T-shirt replaced that of the classic solid color T-shirt of the miner, and was worn by the "younger generation" worldwide. It has been among Marimekko's top sellers since 1968. Fujiwo Ishimoto (b. 1941) began working as a textile designer for Marimekko in 1974, after first working for the company Decembre, set up by Risomatti Ratia, son of Marimekko's founders Armi and Viljo Ratia. Inspired by both Asian art and culture and Finnish traditions and nature, Fujiwo's abstract designs for textiles led the Marimekko line in the 1970s and 1980s, a change from the playful designs of the 1960s that had made Marimekko famous. Among his designs licensed for production in the United States is Kukkaketo (1975), a flower print used in bed linens. Katsuji Wakisaka (b. 1944) worked as a textile designer for Marimekko from 1968 to 1976. Among his best-known designs is Bo Boo, a children's pattern designed in 1975 and composed of cars, buses, and trucks printed in primary colors that became an immediate Marimekko classic. Although originally designed for printed fabrics, Bo Boo provided the basis for a wide selection of articles ranging from towels, sheets, and bags to glassware, ceramics, and toys. It became the most popular Marimekko pattern used in licensed production in the United States. Risomatti Ratia (b. 1941), son of founders Armi and Viljo Ratia, worked for Marimekko from 1973 to 1977 and its subsidiary, Marimekko Inc., from 1977 to 1984. In 1971 he designed Olkalaukku, one of the most beloved and widely sold canvas bags in Marimekko history. From this design came a collection of bags made in a firm cotton canvas available in the timeless colors of black, navy blue, bright red, and khaki gray. The line comprises several types of carryalls, briefcases, shoulder bags, purses, coin purses, and cosmetic cases. See also Art and Fashion; Traditional Dress; T-Shirt. Suhonen, Pekka, and Juhani Pallasmaa, eds. Phenomenon Marimekko. Porvoo, Finland: Marimekko Oy, 1986.